With four generations of apple-growing under their belt, the Dressel Family decided it was time to venture into hard cider, utilizing distinct apple varieties, with a promise to never use apple juice concentrate or dessert apples. Today, Dressel Farms populates its 450-acre farm in New Paltz, New York’s Hudson Valley with seventeen European apple varieties. Its mission is to be “on the leading edge of bringing back the unique, complex, and downright delicious beverage our ancestors knew and loved,” explains Tim Dressel, who owns and founded Kettleborough Cider House in 2011 from the roots of the family’s long-running business. 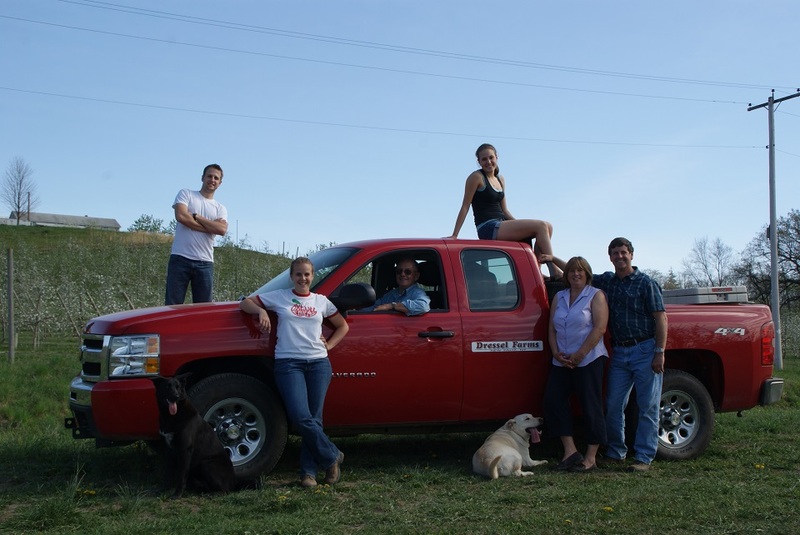 We got the chance to talk more to Dressel about this venture, and what it’s really like to run a family-owned agriculture business. Cider Culture: Was it challenging to convince your family to start your cidery out of the family farm? Tim Dressel: I wouldn’t call it challenging to convince them to let me start Kettleborough, no. No one told me I shouldn’t. The only resistance I got was a bit from my grandfather, who was dubious about cider and its staying power. He was convinced it was a passing fad, and told me not to invest too much into it, as he was worried the market would dry up in five years. He has since abandoned that notion. Why did you want to diversify the family business? Dressel Farms has always believed in diversification. While it’s true the vast majority of our business is wholesale apple production, we grow close to 20 different crops, including strawberries, peaches, corn, pumpkins and more. I’ll refer back to my grandfather again — he’s got an opinion on everything. He loves the saying “never put all your eggs in one basket.” I think that was why he was accepting of my plan to begin with. How is the business structured? Are you the CEO/sole owners of your cidery, or is it part of the overall family business? I am technically the sole member of Kettleborough Cider House, LLC, which is a separate entity from Dressel Farms. I oversee the orchards and all the fermentation and production. My wife handles the finances and tasting room, and we have a few tasting room employees. By far the most difficult part was/is navigating the government regulations and legal hoops that need to be jumped through. Most enjoyable to me is planting new varieties, watching the orchards grow, harvesting apple varieties I’d never heard of before, and experimenting with them in the cidery. Hardly at all. Occasionally my sister will help me clean tanks or do pump-overs, but for the most part, it’s just me. They all love taste-testing though! How has it helped and/or changed the farm/orchard? The most notable influence is having the tasting room on site as an additional attraction to the farm. Our U-Pick operation used to be the way Kettleborough got customers when we were completely new and unknown. While “leeching” off Dressel Farms still definitely occurs, we’re seeing a lot of customers seeking out Kettleborough and then staying for Dressel, which is exciting. I believe the explosion of growth will level off in the near future and a slight “weeding out” of less-committed or ineffective cideries will probably occur, for better or worse. The local and national cider organizations will strengthen and hopefully be able to push further legislative changes that will positively influence the American cider market. We began commercial production in 2012 and the cider renaissance was still in its infancy. We were spending more time answering the question “so what IS hard cider?” than anything else, and most customers were only interested in super-sweet ciders. Since then, gradually at first but more rapidly lately, customers have become more informed about cider and more interested in unique, high-quality ciders. The sweet market is still very much a factor, but we’ve seen our drier ciders become much more popular than they originally were. Besides the obvious technical skills I’ve learned and developed, I’ve gotten to know a lot about appealing to the consumer. While I went to school for marketing and business management, I’ve never been much of a salesman. Learning how to sell my cider to people unfamiliar with my products (or even hard cider in general) took some time, and I’m certainly still evolving in that sense. What do you think the next few years will bring for your cidery? We seem to be at a crossroads. Until now, KCH has been my self-described “evening and weekend” job. While I still work full-time for Dressel Farms, it’s difficult to commit much time to Kettleborough. Lately, Kettleborough has reached a point where any additional growth will require a large amount of time and money investment. Hopefully, this means that we’ll be expanding rapidly in the next few years. Our wish list includes a stand-alone tasting and production building, an event space, and possibly a satellite location. What does your family think about your cidery now that you’ve been operating for a few years? Have their attitudes/opinions changed during that time, or were they supportive from the start? Everyone has always been very supportive along the way. Lately, with the expansion of space and hours we’ve done, we’ve seen more customers, and our growth has been more evident. This has excited everyone, including my risk-averse grandfather, who frequently comments on how many cars he saw in my parking lot the day before. Do you have plans to expand your hard cider production, or do you want to keep it local to being available basically in just New Paltz? This is a question I’ve been wrestling with for the past year or so. I’ve never enjoyed wholesale, and I don’t look forward to having to work with a distributor. After the success of beefing up our retail space this year, I think I’d really like to focus on having an expansive, unique retail/taproom atmosphere and continue to keep distribution to a local circle. Your website lists four flavors. Which is your best-selling, and what other flavors do you have in the works, or are interested in trying? At the moment, our best seller is Honey Honey, although it doesn’t outsell the others like it used to (I attribute this in part to the evolving and maturing taste of our customers). For the future, I’d like to create a rosé cider, a cider to fill the semi-dry gap in our list, and then, as my orchards come into full production, expand on my use of our European fruit to create a more ultra-premium Old World line. To learn more about Kettleborough Cider House, visit its website, or follow along on Facebook. Kettleborough Cider House is located at 277 State Route 208 in New Paltz, NY; phone: (845) 255-7717.